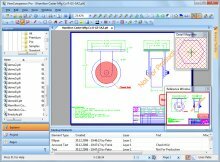 Software Companions is fully focused on developing powerful products for viewing, printing and conversion of file formats that are commonly used in the CAD/CAM market. We do also develop and sell components that are used in applications developed by other companies. Software Companions was founded in 1997 in Oslo, Norway and is a privately held firm. Software Companions is market driven, and we develop our software based on the needs of our users. 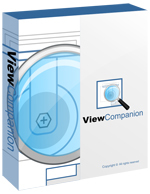 ViewCompanion Pro™ is a powerful, but easy to use, application for viewing, printing and converting PLT, Adobe PDF, Autodesk DWF, CGM, TIFF, Calcomp, CALS and several other formats. Use ViewCompanion to convert your files to standard formats like Adobe PDF, PDF/A, DWF, DXF, CALS, TIFF, PNG and more. Please see the complete list of supported output formats below. No extra applications or drivers is needed for the conversion to the different formats. More details about the conversion formats can be found here. You can use ViewCompanion Pro to add markups/comments to your drawings. If you need to distribute drawings on the Internet, you can convert your drawings to Autodesk Drawing Web Format (DWF), Scalable Vector Graphics (SVG) or Adobe PDF. All these formats are very popular for distributing drawings. ViewCompanion can convert multiple files of different formats to a single multi-page PDF file. You can also use ViewCompanion to convert HPGL/2, CGM and DWF files to AutoDesk DXF format which you can read in any major CAD application, e.g. : Autodesk AutoCAD or Microstation. Both batch conversion and printing is available. ViewCompanion gives you advanced functions for zooming and panning, so that you can view your files fast and accurate, before printing or converting them. The mouse wheel can be used for zooming and panning operations. With ViewCompanion Pro you can add markups to the loaded file. Supported markup elements include rectangles, lines, dimension lines, area measurements, ellipses, polygons, text, arrows, stamps and images. You can select one of the predefined stamps or create your own. User defined symbol libraries makes it easy to add frequently used symbols as markups. Hyper links can be added to markup elements, and a hyper link can either open another drawing in ViewCompanion, or open an Internet location using the default browser. All markup elements are stored in a separate file. The original file will be left unchanged. The markup elements can optionally be included when the viewed file is printed or converted. 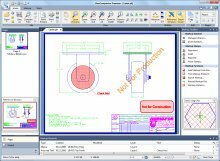 The markup elements can be exported to a DXF file. Both batch conversion and printing is included. All new licenses include 12-months of free software maintenance. View, markup, convert and print files of different formats. Conversion to other standard formats, see below for a list of supported formats. Extensive set of command line parameters for conversion and printing. Open files directly from a ZIP archive. Drag and Drop supported. Both single and multiple files. Rotate loaded files in steps of 90 degrees. Load rotated with user-defined rotation. Add footer/header containing date, scale, time and filename when printing. Add watermark using text or a raster image. Color or Black & White Printing. Scaled print or fit to paper. Poster mode for printing big format drawings on multiple sheets, e.g. print an A0 drawing in full size using multiple A4 sheets. Print to all Windows supported plotter and printer devices. Overlay up to 10 files and print as one drawing. Markup by using lines, text, rectangles, ellipses, images, polygons, arrows, stamps, dimension lines and measurement areas. Truetype fonts used for markup text entities. Include markups during printing and conversion. Create password protected DWF and PDF files. Define user Pen Table full control of colors, styles and widths. Also supported for batch printing and conversion. Distance measurement with entity snap. Polygonal area measurements with entity snap. Supports Metric and Imperial coordinates. DDE Interface for easy integration with other programs. Send a file directly to another person using E-Mail from within the program. If a markup file exists, it will also be attached to the message. Copy selected region to clipboard, and paste into another Windows application. Store commonly used files in projects. Easy to use installation and uninstallation software. Multiple Document Interface (MDI) makes it easy to view several files at once. Microsoft IntelliMouse supported for zooming and panning operations. Supports HP-RTL files (HPGL with raster data). AutoDesk DWF and DWFx 2D. Computer Graphics Metafile (CGM) Binary (Profiles: ATA, CALS, WEBCGM and CGM*PIP). Structured Fax Format (SFF). Multi page. TIFF (uncompressed, packbits, LZW, CCITT G3 and G4). Multi page. The Multi page note means that a HPGL, SFF or TIFF file with multiple pages, can be converted to a multi page file of the specific format. Windows XP (SP3), 32 and 64 bit. No extra applications or drivers are needed for conversion to the different formats. Adobe PDF, Autodesk Drawing Web Format (DWF) and Scalable Vector Graphics (SVG) are very useful and popular formats for distributing drawings on the Internet. 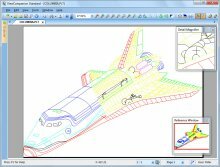 ViewCompanion can convert your PLT, Gerber, CGM and DWF files to Autodesk DXF format which you can read in any major CAD application. You may measure distances and areas using ViewCompanion's precise measurement tools with snap to drawing geometry. If your drawings are not in original scale (1:1) you may calibrate the measurement tools to provide correct results. Use ViewCompanion to annotate a file using elements like rectangles, lines, dimension lines, area measurements, text, polygons, text, arrows, symbols, stamps, images and more. All markup elements will be stored in a separate file and the original file will not be modified. With the Pro and Premium editions you can add markup to the loaded file. Among the supported markup elements you will find text, rectangles, ellipses, polygons, arrows, symbols, stamps and images. Markup elements will be stored in a separate file and the original file will not be changed. The Pro edition can, in addition to all the formats that Standard can handle, read TIFF, CALS, JPEG, BMP and PNG files. The Premium edition supports all Pro formats and in addition the following formats: Adobe PDF, Postscript, EDMICS and JPEG2000. If you need to distribute drawings, e.g. on the Internet, you can convert your drawings to Autodesk Drawing Web Format (DWF), Scalable Vector Graphics (SVG) or Adobe PDF. All these formats are very popular for distributing drawings. You can convert multiple files of different formats to a single multi-page PDF, DWF or TIFF file. ViewCompanion can split a multi-page PDF, PDF or DWF files into several single paged files. Your PLT, PDF, CGM and DWF files can be converted to Autodesk DXF format, which can be read by almost all CAD application, e.g. : Autodesk AutoCAD and Microstation. Use Viewcompanion's precise tools to measure dimension lengths and areas. You can measure using snap to drawing geometry for highest accuracy. Calibration of the measurement tools is available to make sure you get correct results if your drawings are not 1:1. The measurement results may be exported to csv, which can be loaded into Excel or any other spreadsheet application. With ViewCompanion Premium you can add markups to the loaded file. Supported markup elements include rectangles, lines, dimension lines, area measurements, ellipses, polygons, text, arrows, stamps and images. You can select one of the predefined stamps or create your own. User defined symbol libraries makes it easy to add frequently used symbols as markups. Hyperlinks can be added to markup elements, and a hyperlink can either open another drawing inside ViewCompanion, or open an Internet location (URL) using the default browser. All markup elements are stored in a separate file and the original file will be left unmodified. The markup elements can optionally be included when the viewed file is printed or converted. You can export markup elements as Autodesk DXF, Autodesk DWF, CGM and other formats. ViewCompanion gives you advanced functions for zooming and panning, so that you can view your files fast and accurate, before printing or converting them. Tools for removing pages from, and adding pages to, multipage PDF and TIFF files. Support for for PDF layers. Added support for the new WebP file format. All Markup functions are now available in the Standard edition. This update is certified for Windows 10. 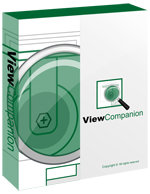 ViewCompanion Pro, Premium and Standard version 8.00 has been released! The most important news in this update is full support for AutoDesk DWF and DWFx 2D formats and a new shell extension. ViewCompanion can now also be used to view, markup, convert and print DWF/DWFx 2D files. This update has been tested with Windows 8.1 and are fully compatible with Windows XP (SP3), Server 2003, Server 2008, Server 2012, Vista, 7, 8 and 8.1 (all editions).